Plus an Easy Homemade Pizza recipe you'll love! The task of creating a healthy school lunch your kids will love is now easier with Cancer Council NSW’s newly launched Healthy Lunch Box website. The website includes recipes, ideas and tips – and it also features an interactive lunch box builder that enables parents and their kids to plan a healthy lunch box at home, or on the move with their smartphone or tablet. The Healthy Lunch Box shows parents how easy it can be to add more fruit and veg and pack a lunch box that kids will love to eat while encouraging behaviour that has lifelong cancer prevention benefits. One in three cancer cases can be prevented by adopting a healthy lifestyle, which includes eating well, being active and maintaining a healthy weight. But only 7 per cent of NSW children eat enough vegetables and 22 per cent of children are overweight or obese. The website has been launched as part of Cancer Council NSW’s Eat It To Beat It program which runs free sessions and workshops for parents of primary aged school children, helping them to understand why fruit and vegetables are so important. 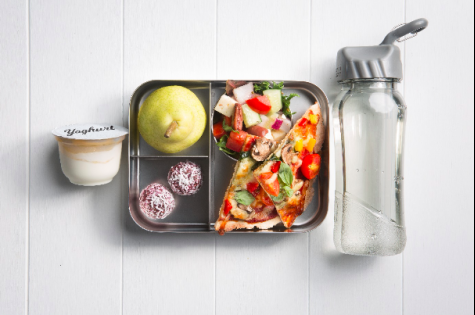 Cancer Council NSW’s Nutrition Program Manager, Clare Hughes, said parents want quick and easy access to healthy recipes and inspiration on how to vary lunch box content. “Parents want to ensure they are providing their kids with the energy and nutrients they need to learn and play,” she said. “With one child eating about 2,500 lunches throughout their years at school, many parents report that packing lunch boxes can be a chore, especially when it comes to getting kids enthusiastic about healthy options such as fruit and vegetables. “Adding fruit and vegetables to the lunch box every day is a simple way to ensure children are getting the vitamins, minerals and fibre they need to fuel concentration in the classroom – and the cancer prevention benefits of eating a healthy and balanced diet are so important too. “The Healthy Lunch Box website provides something for everyone. Parents are sure to find something that appeals to the fussiest of eaters and parents can even use the website as inspiration for their own lunches,” Ms Hughes concluded. The website has been made possible thanks to the ongoing generosity of OUTRUN CANCER and the community. Visit healthylunchbox.com.au and pack a tasty healthy lunch box today! Pre-heat oven to 220 o C.
Mix the flour and yoghurt together until well combined and a smooth dough is formed. Divide into either 2 large balls or 8 small balls for kid-sized pizzas. Roll out on a floured surface with a rolling pin. Spread pizza bases with a thin layer of tomato sauce. Top with mushrooms, red and yellow capsicum, tomatoes, spinach and basil leaves. Sprinkle with grated cheese. Bake for approximately 10 minutes or until the crust is golden brown and cooked through. Variation: Try adding leftover cooked chicken or canned pineapple pieces. Try using Lebanese bread instead of making the pizza dough for an even quicker and easier meal solution. Note: You can freeze the dough for up to 3 months. Simply divide into portions in freezer bags. When ready to use thaw overnight in the fridge and bring to room temperature on the bench top for approximately 30 minutes before shaping into your pizza base. Bring a large pot of water to the boil and add the tomatoes, ensuring they are covered. Bring back to the boil then remove from the heat and drain. Allow to cool then peel and dice, discarding the stems. Set aside. In a large pot, heat the oil and add the garlic and onion. Sauté until translucent. Add the tomatoes, bay leaves, basil and paprika. Stir well and bring to the boil. Reduce to a simmer and cook for approximately 2 hours until the sauce has thickened. Remove from the heat. Cool and transfer into airtight containers. Tip: Allow the sauce to sit in the refrigerator for 24-48 hours to allow the flavours to develop. Remove the bay leaves before serving. Cook your favourite pasta, add the tomato sauce and serve with a sprinkle of grated cheese.